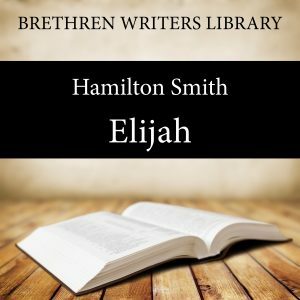 In ‘Elijah’, Hamilton Smith traces the major events of the life of Elijah, the Prophet of God, with all the highs and lows in his work as a prophet. Elijah knew only too well the inadequacies of his own humanity - he was a man who was “subject to like passions as we are”. But Elijah knew the living God, was conscious of His presence, and was aware that prayer brought him into contact with the greatest power in the universe. By experience, he comes to understand that the God of creation, power and judgment, is supremely the God of grace. At each step, the author presents clear, practical lessons for Christians today as they too seek to present God's word with authority to an indifferent or antgonistic world. A word about the author: Hamilton Smith 1862 -1943 was born in Barnes, Surrey, England. By 1901, living in Sutton, Surrey, with his wife Rachel and young family, he had entered full-time upon the task of building up the church of God. He and his cousin F.B. Hole were linked in business before their full-time ministry for the Lord. Later in life, he moved to Weston-super-Mare in Somerset, His personal ministry was delivered in the United Kingdom, but his written ministry continues to be read worldwide. Hamilton Smith is a much loved expositor of the Scriptures. He wrote on many different portions of the Bible but is probably best known for his character studies of Abraham, Elijah, Elisha, Joseph, and Ruth which have been published in several languages. Hamilton Smith's written expositions of the Scriptures are brief, clear and to the point. This volume is one of a series of Old Testament character studies for which he is probably best known. He was on the editorial committee of Scripture Truth magazine at its founding in 1909, and contributed many articles to this magazine.